l UN Global Compact Network Korea quotes POSCO’s activities in support of SDGs. l Cited best business practices include corporate actions pertaining to environmental sustainability and volunteering. POSCO’s corporate citizen activities received a nod from the world’s largest corporate sustainability initiative, the United Nations Global Compact (hereafter UNGC). 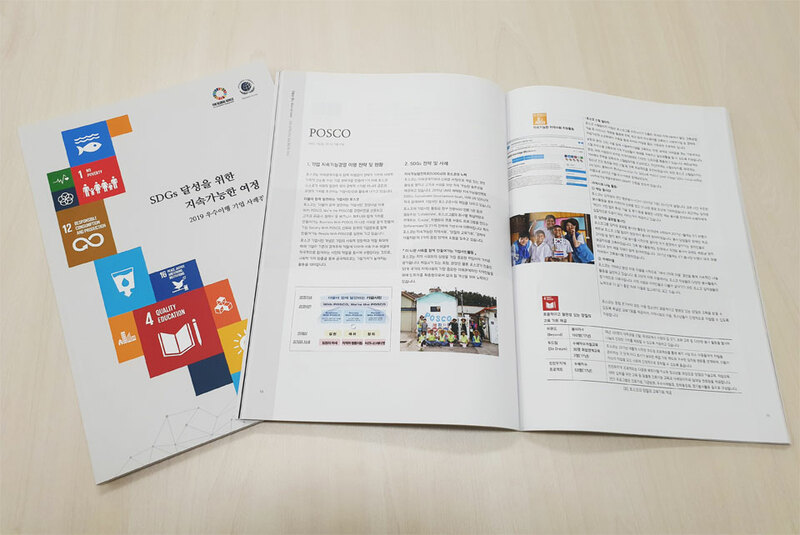 In its 2019 publication of ‘Sustainable Journey Towards Agenda 2030 – Best Korean Companies Implementing SDGs,’ the UNGC Network Korea introduced POSCO’s various endeavors pertaining to corporate social responsibility. *SDGs (Sustainable Development Goals), aka the Global Goals, are a universal call to action set by the United Nations General Assembly to end poverty, protect the planet and ensure that all people enjoy peace and prosperity. ▲POSCO’s corporate citizenship endeavors featured in the UNGC Network Korea’s 2019 publication of the ‘Sustainable Journey Towards Agenda 2030 – Best Korean Companies Implementing SDGs.’ Specifically recognized are POSCO’s various activities in support of corporate social responsibility, environmental sustainability, and sustainable energy for the future, together with the company’s new management principles. The UNGC Network Korea introduces various collective actions of Korean companies in support of SDGs. The publication will be disseminated across various conferences, both domestic and international, as well as at the UNGC Leadership Summit in New York. This year, altogether 23 Korean companies and institutions with exemplary business practices were cited in the publication. This year’s publication specifically highlights POSCO’s CSR activities to grow with the communities, along with the company’s corporate citizenship endeavors: from addressing climate change to embracing sustainable energy future. The UNGC Network Korea announced such details at its General Assembly on March 26th. The UNGC introduces management principles, key strategies and collective actions of companies in support of SDGs – the current publication is available in Korean, and the subsequent English publication is expected in May. The English version will be distributed across several global CSR communities. POSCO has been a member of the United Nations Global Compact since 2012.